We walked on to Odeh Khaseeb while he's picking olives with his grandson who's studying to be a criminal investigator in the university in Jerusalem. 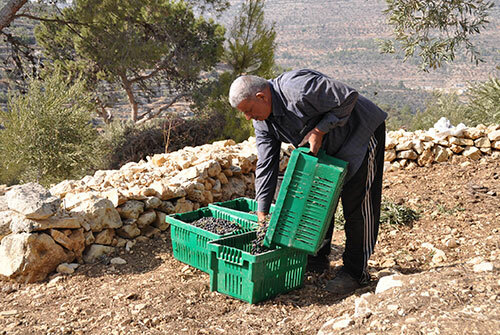 Odeh told us that he's been picking olives with his grandson for over a week, and he could never be happier; they're bonding in a very special way, and they've never been closer. In few minutes, the camera crew of "Al Arabiya" television network arrived and started setting up their equipment for an interview they're shooting with Odeh to talk about his ability to make olive oil economically viable while still maintaining the highest levels of quality using only organic farming practices. After a lot of laughter between the retakes, Odeh finished the interview with a sentence that still resonates in our mind, a sentence through which he summarized his way of dealing with olives; Odea said: "while we Palestinians believe that the olive tree is blessed and we treat it like such, the road to sustainability passes through commitment to high quality and even a higher commitment to the health of land and soil."